Discussion in 'The Lounge' started by Cherrim, Jun 5, 2011. Specifically the "Press Start to Continue: The Maturing of Mario" later revision, but I prefer this cover. Like, it's a book about Nintendo but there's a Sega Dreamcast swirl on it. And a jack-o-lantern TV. And a cat for some reason. A car with teeth that's exploding just because. Someone recommended I read it ages ago because they did, and I'm only just get around to it now. That's all for this latest update in what has apparently become the "what is triffy reading now" thread. I didn't read a single book all last year and the year before that I read a grand total of 2. I feel pretty ashamed about that, so I dragged myself to the local public library this week and got myself a library card and took out a few books. Set my challenge marker on Goodreads to 10 books for the year, so hopefully I can at least meet that. The other books I took out were The Name of the Star by Maureen Johnson and Feed by Mira Grant. The librarian was SUPER EXCITED when she saw the latter in my pile and went ahead and reserved the second book for me so now I have to read it, lmfao. I think it's about zombies? idk, it was recommended to me on Goodreads years ago but I was too cheap to buy it. The former is a young adult book and I have no clue what it's about but I really like the author because she's interesting on social media, haha. I should read more, but I don't. I maybe read one or two books a year, and that's really bad for someone who wants to write. Oh well, I'm working on it. I got two Stephen King books entitled, "The Green Mile" and, "Under the Dome" for Christmas, so hopefully I'll read those soon and move onto something else. The latter of the two is the thickest book I own, and it might just take me a year to read the entire thing, haha. I finished the Thrawn trilogy a little while back. Oh man, I hope the new Star Wars Sequel Trilogy borrows little, if anything at all, from those books. I liked Thrawn (minus his trademark red glowing eyes which have nothing to do with the story, so wtf bringing them up all the time? They don't shoot lasers or anything) and Pellaeon and their dynamic. Karrde the smuggler was okay too. But the rest of the characters? Leia, I don't know who that lady wasn't but it wasn't like Leia at all. Or well, actually I guess it was. That weird hippie Leia from the end of Return of the Jedi and not the cool sarcastic one from the rest of the trilogy. Luke was super naive. Like he's full-on Jedi at this point, you'd think he'd be a little wiser? Han and Lando were alright. The major new character of Mara Jade though, jeeze... why does the fanbase love her so? She's very one note. "I'M GOING TO KILL LUKE SKYWALKER" she says to everyone at any chance she gets - including Luke and Leia, and no one bats an eye. "I'm going to kill you" "That's cool, can you help me lift this log?" Evil deranged Jedi clone as the ultimate villain was lame since he really had no plan for anything besides beings nuts and did very little across the trilogy besides be grumpy. And sloths that can repel the force so people where them on their backs like backpacks? Gah. Didn't care for these books. If you want a good Star Wars book, pick up Shadows of the Empire which takes places between Episodes V and VI and actually feels like it belongs there. I'm super thankful that Disney has exiled these books and others from the old expanded universe out of their new canon. Would be a horrible thing to drag down their universe if they had to adhere to these lame stories. And now I'm reading From Russia with Love. I want to get all the Bond books I haven't read yet out of the way before the movie comes out this year. First half of this book was boring, just the Russian perspective and build-up. Second half is Bond-centric and has picked up my interest now. I hadn't intended on reading beyond Fleming's original works, besides possibly "Devil May Care" because he wrote it in Fleming's style and prose and I was curious how that turned out. But I ended up reading the other two non-Fleming 60's tales too. I was surprised that only Dr. No has that over the top style of the older movies. It doesn't really fit in with the other books. Like... there's a grand underwater lair and Bond fights a giant squid. The other books don't get so fantastical and unrealistic. Personal favourites would be Moonraker (unlike the wacky movie, Bond does not become an astronaut here lol), Goldfinger, Thunderball, and The Spy Who Loved Me. Now, nobody else seems to actually enjoy that last one. Fleming even forbade the movie franchise producers from adapting it beyond the use of the title. Bond is present, but it isn't from his perspective or about him, he just shows up. It's about a resourceful Canadian girl trying to find herself and make her way in the world, but unfortunately happens to find herself in the middle of a horrible and dangerous situation. The narrative structure is totally different from the other entries in the series. I also enjoyed how much the books focused on what Bond eats lol Occasionally even throwing in a footnote on how to make a drink or meal to Bond's liking. We share similar tastes. Exotic locations, well-described food, action and suspense, superfluous romance; was a good read all together back to back. I am currently reading "Console Wars: Sega, Nintendo, and the Battle that Defined a Generation" by Blake Harris. I'm not terribly far into it yet. It's an interesting take. It isn't historical. It has a narrative. There's a disclaimer at the start emphasizing this. It's a dramatization of events with dialogue focusing on tone and getting the point across instead of representing what was actually said. It's like "The Social Network"'s take on Facebook. It's not really what happened, but it's close enough and probably more interesting. I wrapped up reading "Console Wars: Sega, Nintendo, and the Battle that Defined a Generation" by Blake Harris. That was great. I recommend that anyone with an interest of the video game industry, or... marketing as that's a large part of the tale, or grew up in the 90s and remember all the Sega Does What Nintendon't stuff. 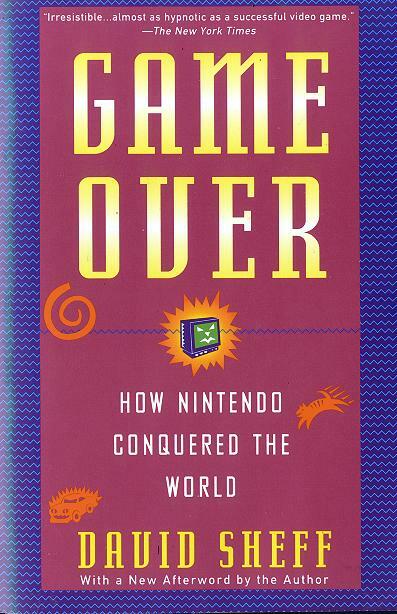 It plays out a bit like a sequel to "Game Over: How Nintendo Conquered the World" by David Sheff. That book was a journalistic telling of Nintendo's early days, the revitalization of the North American video game industry, the major players in the company, and their days of incredible success with the NES. That book ended though with Sega right around the corner. "Console Wars" more-or-less continues from there. Same kind of material, but for Sega - despite Nintendo being in the subtitle of the book. This story is all about Sega through and through. There are some occasional bits on Nintendo and their reactions, or lack thereof, to what Sega was doing, and their on-and-off love triangle with Sony. Nintendo of America is the villain, Sega of America the underdog. And then the blanket is uncovered in the last act to reveal the true diabolical mastermind - Sega of Japan. lol If you're into behind-the-scenes inside baseball type stuff with video games, this book is for you. Unlike "Game Over", which was, as I mentioned, journalistic, "Console Wars" was clearly written with an eventual movie in mind (in fact a documentary and a dramatization are both in the works; the latter by Sony, ironically). It is dialogue driven and scene based. Not all entirely accurate, focusing on tone and meaning instead of a word-for-word transcript. Hypothesized conversations, approved by those being depicted. It's an odd technique. But like I mentioned in my last post, it comes off a bit like "The Social Network"'s take on Facebook (although I have more faith in the series of events in "Console Wars"). I learned some interesting things that were just... outstanding. Sega of Japan's serious risk aversion, jealousy of Sega of America, and sabotage by killing off the successful Genesis early. Sega of America wanting to partner up with Sony, then Silicon Graphics - which fell apart and told SGI to toss the contract Nintendo's way to get back at SoJ - hello birth of the Nintendo 64. SoA's hatred of Nintendo and down-right lying in their advertisements (no such thing as "blast processing"). What Sega was able to do, taking on the arrogant giant that was Nintendo was amazing. How they impacting the industry with retailer and third party relations, serving Nintendo a piece of humble pie in the process. Also the birth of content ratings. And then to see Japan destroy it all was just so disappointing. I finished The Green Mile, and wow was it good. A roller coaster of emotions, and I'm not sure if I want to get back into reading if I'll have to face that feeling of finishing a masterpiece over and over again, haha.